After a couple days at home after Stockholm, it was back in the air and over to Bordeaux for another work do. 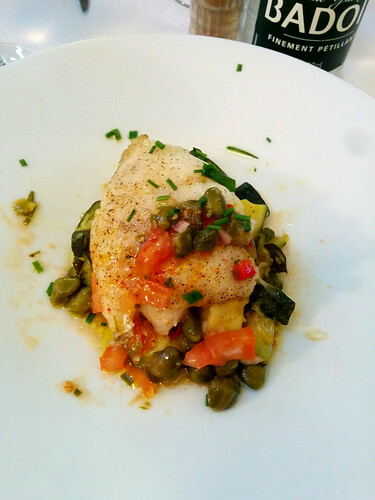 I landed in the evening and immediately set out in search of dinner – a friend from Bordeaux recommended Le Scopitone and it was there I headed. 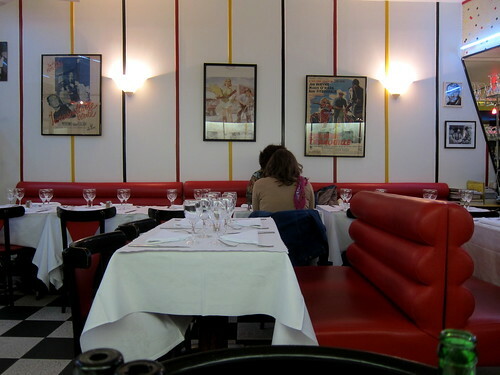 I was very taken with the little retro restaurant! 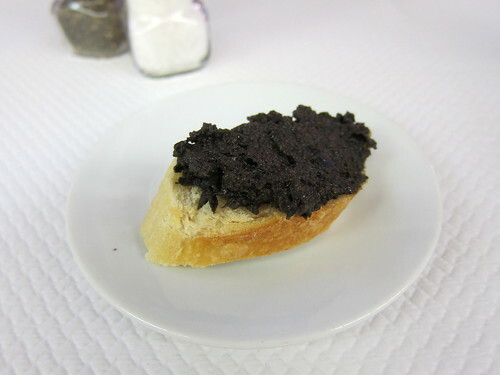 I was brought a little tapenade on toast to nibble on whilst I perused the menu. There’s a fantastic set menu deal that changes daily but I went a la carte to get the fish I desired. Service was lovely – one waitress offered me a local newspaper to read while I waited for my meal (I was by myself) though perhaps the grisly front page news of a found body wasn’t so meal appropriate. Anyway, great service! 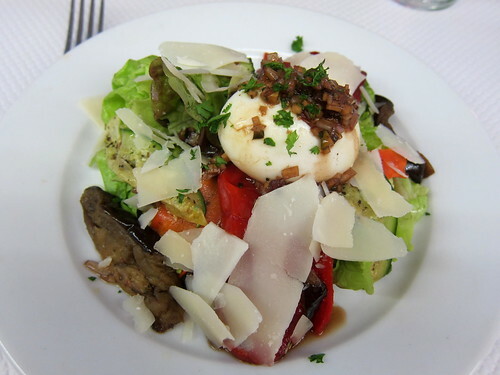 I started with a brilliant tarte fine with grilled vegetables…brilliant because it was an unexpected large pile of those grilled vegetables and salad and a soft boiled egg on a little sliver of pastry. 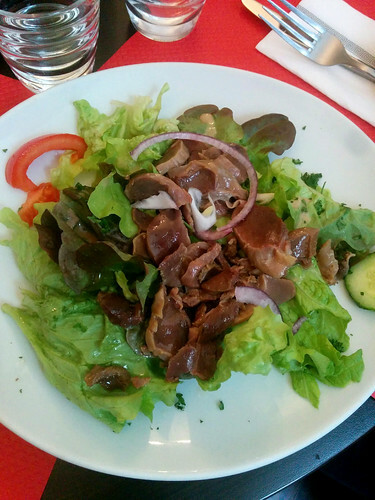 Yes, take my word for it – there was a bit of pastry under that salad and I loved it all. 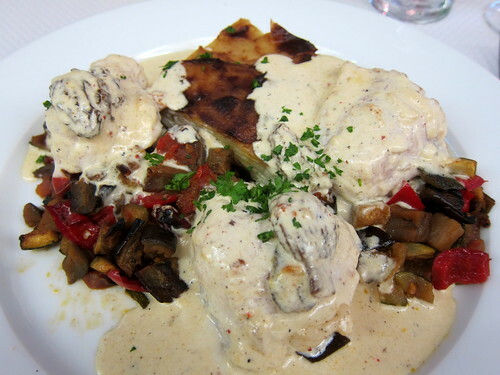 My main course was monkfish with morels, all with a rich cream sauce and an equally rich slice of potato gratin. Oh, and more roast vegetables. 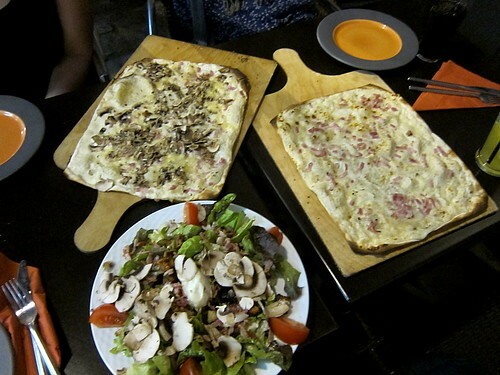 The food here was excellent and the portion sizes massive! 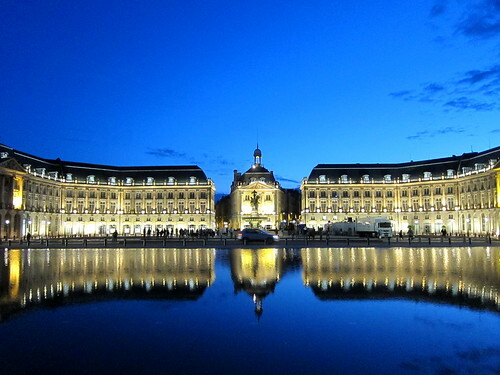 After dinner, I strolled around the city centre and it is exceptionally beautiful down by the water and here at the Bourse and the Miroir d’Eau! 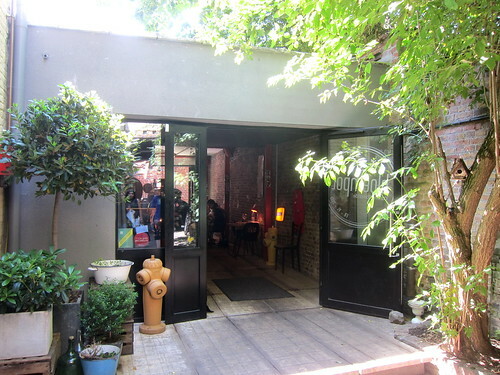 I was wandering around Bordeaux on another day when I came across this adorable Uighur restaurant – Route de la Soie. It was exactly what I felt like that afternoon and settled in for a plateful of polo, here served with the salad of the day and some yogurt. 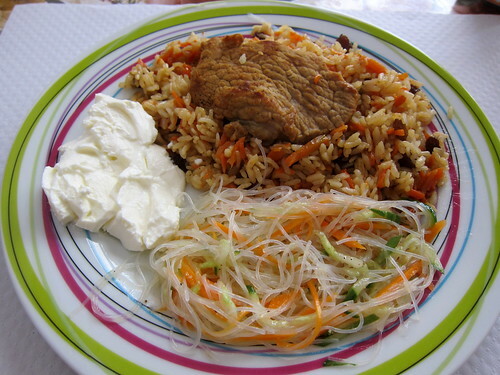 Polo was their pilau rice, very similar to an Uzbek plov, made with lamb and lots of grated carrots. The salad was mainly cold glass noodles with carrots and cucumbers in a moreish garlicky dressing. This place is brilliant if you’re looking for a little something different! I didn’t have much time to see lots of sights but did have time for another bit of a stroll through the city. I loved the quays area and found myself back there again, this time during the day. 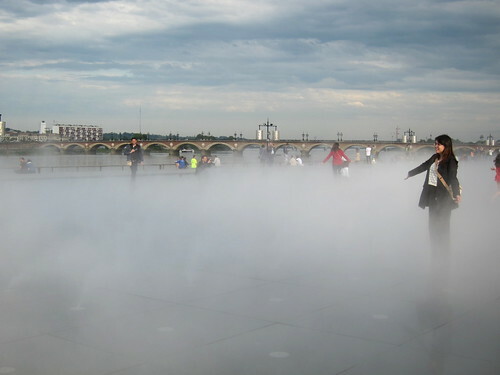 This time, I could see that the Miroir didn’t just fill up with water but could also release a spray that made everything look all moody and fantastic. 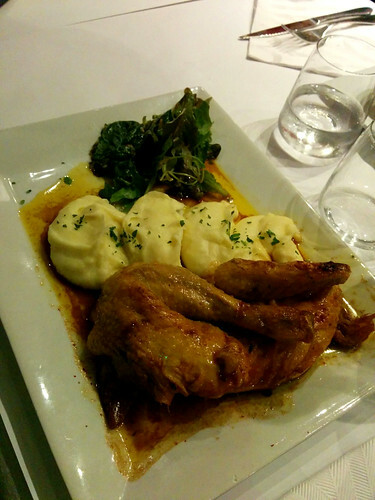 On my last evening, a group of us headed back to the centre of the city and randomly chose a restaurant with a very Bordelaise menu – this turned out to be Père Chabrot, a relatively new restaurant located in an old wine cellar. 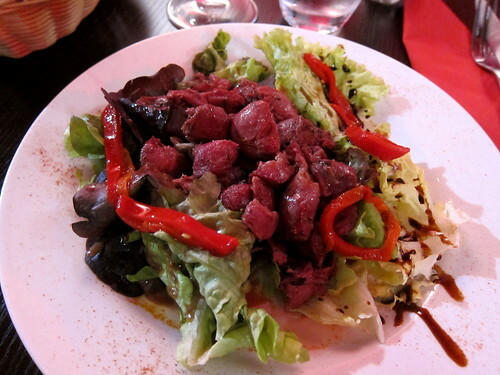 My starter of salade de gésiers was delicious – the confit duck gizzards were wonderfully tender and the entire salad was enlivened with a raspberry vinaigrette. My faux filet avec sauce Bordelaise was cooked perfectly à point. 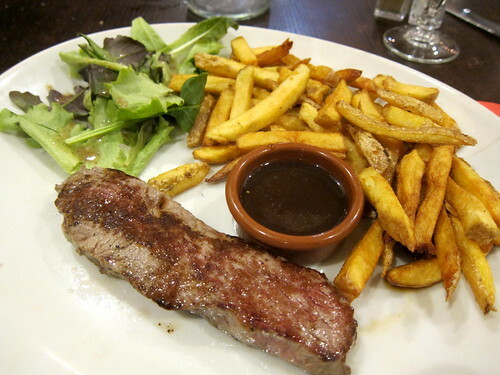 Good stuff – I was a little surprised that despite its proximity to water, the cuisine of Bordeaux is mainly defined by meat. 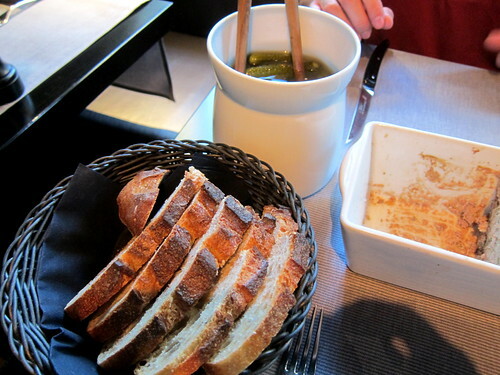 I loved the sauce Bordelaise, made with red wine and marrow. The accompanying fries were excellent and there were enough for the whole table! 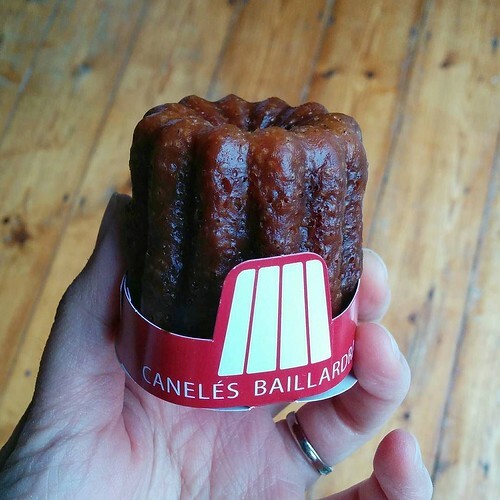 And, of course, one couldn’t leave without trying Bordeaux’s most famous pastry: the canelé. 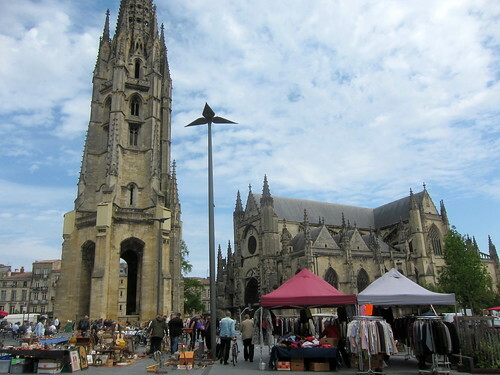 The place to get them is Baillardran, and there are quite a few branches scattered around Bordeaux and at the airport too. It was at the airport that I picked up a few to take home. They’re apparently not everyone’s cup of tea and I originally thought they perhaps weren’t mine. 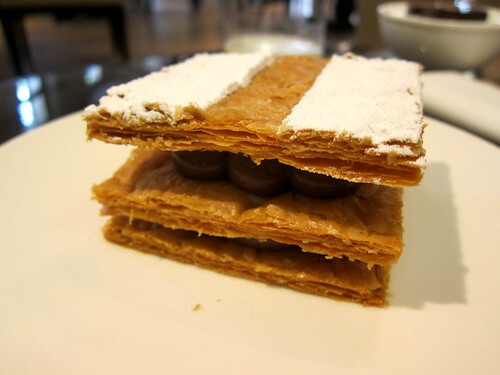 I realised that I liked them when I tried the original size (as pictured above) – these were custardy and vanillaey and with a lovely chewy crust. You don’t get the nice contrasts with the smaller sizes. Go big with canelés! 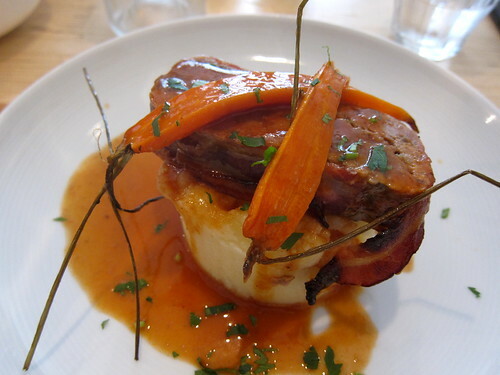 It’s a great city to visit for a couple of days and there’s certainly some good eating there. 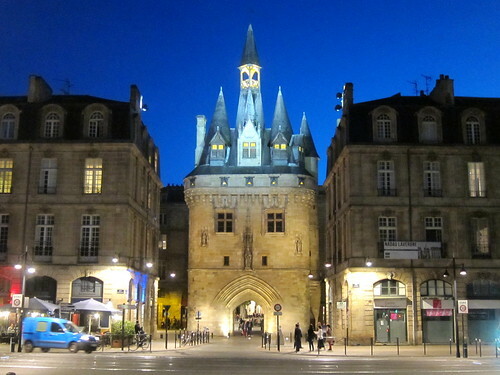 If you’re a fan of wine, well, the recently opened Cité du Vin is surely up your street (not so for me as I cannot drink wine – a bit of a shame in Bordeaux!). 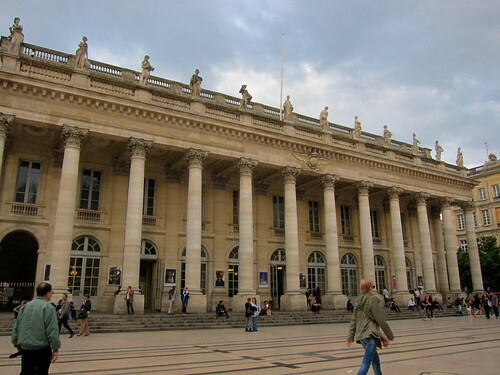 All my photos from this short trip to Bordeaux can be found in this album. We spent our wedding anniversary in Paris! Yeah, it sounds romantic but I forgot about it until late in the day – haha! 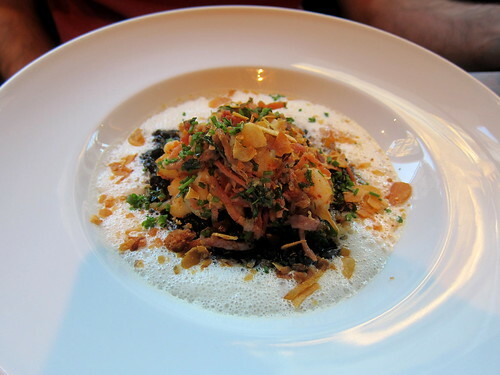 Luckily, I had planned ahead and already booked a table for dinner at La Régalade Conservatoire, the third and newest location of La Régalade under chef Bruno Doucet. TimeOut Paris even called it one of the most romantic restaurants in Paris; I was sold. 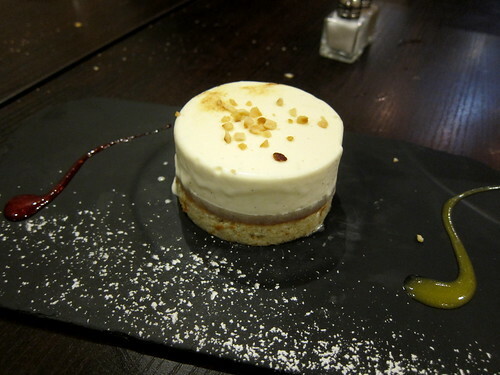 We arrived to a warm welcome with excellent service throughout the entire meal. 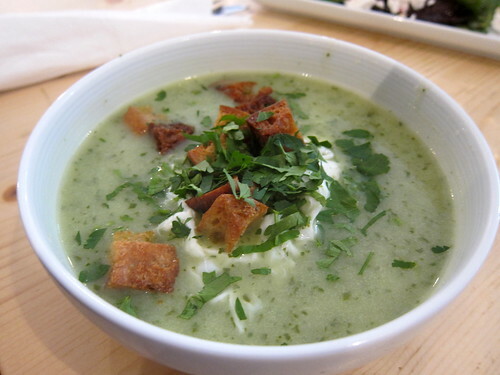 There’s a menu for dinner – 3 courses for €37, with supplements for some of the specials of the day. 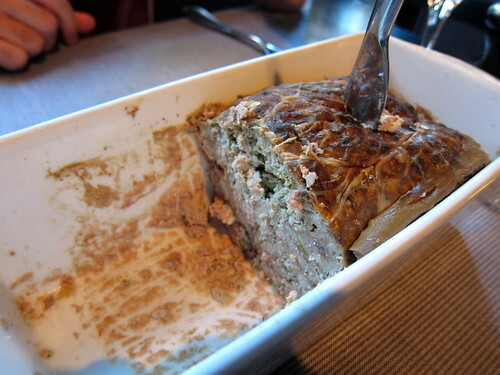 We started with a huge (and delicious) pork terrine that was plonked onto our table. We were to help ourselves to as much as we desired. 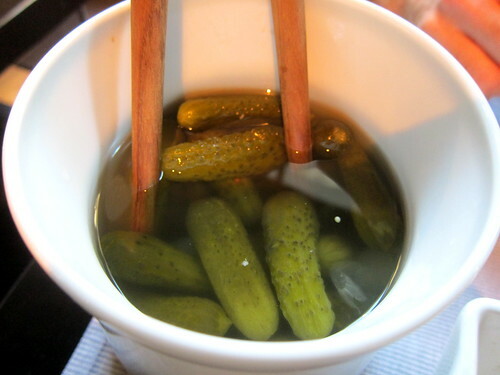 …and a crock of equally excellent cornichons. It’s too easy to fill up on all of this but we did have to keep room for the dishes we actually ordered! Starters. Makis de maquereau, concombre et poivron, mayonnaise citron vert et avocat. 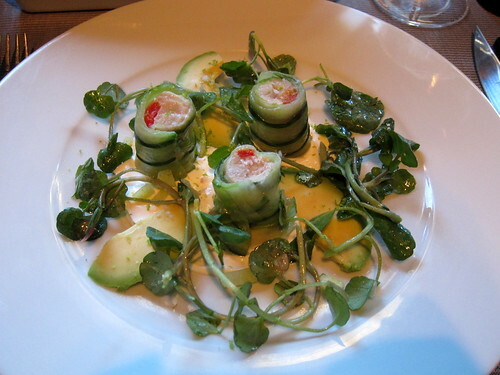 This was a refreshing salad with rolls of mackerel and cucumber. 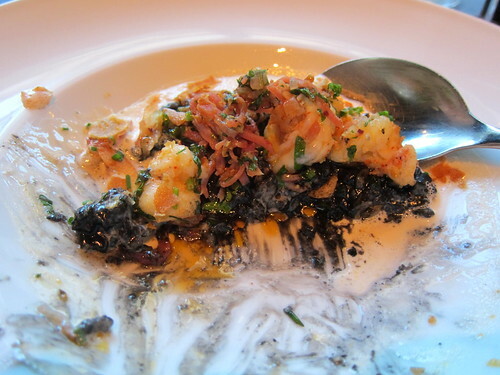 Risotto crémeux à l’encre de seiche, gambas rôties à l’ail, émulsion de vache qui rit. Rice, seafood, garlic – what’s not to like? 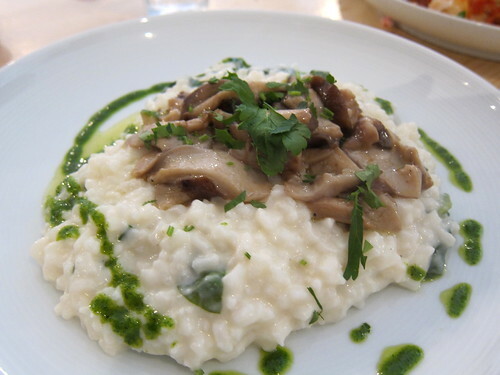 Just look at the fabulous colour of that risotto! 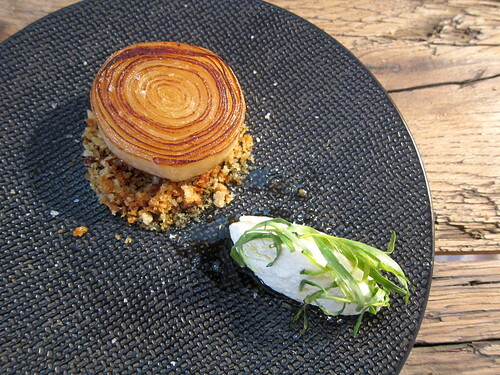 There was even a bit of dried cuttlefish or something similar on top that had a great salty chewiness. And a foam of vache qui rit cheese? Genius. Main courses. 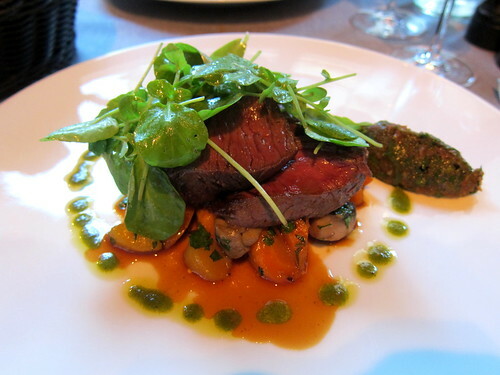 Veau en deux cuissons, caillette au jus de veau et quasi rôti, légumes verts de printemps. 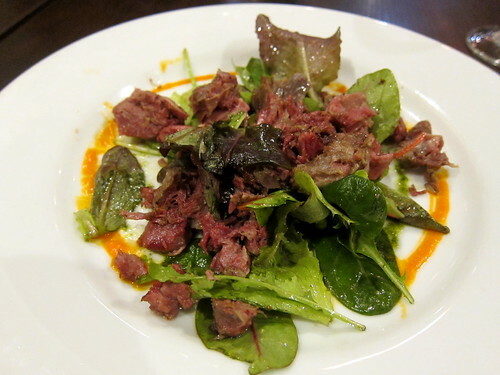 Here we had veal in two styles – a roasted cut akin to a lean loin and a caillette (kind of like a forcemeat ball). It was all gorgeous. 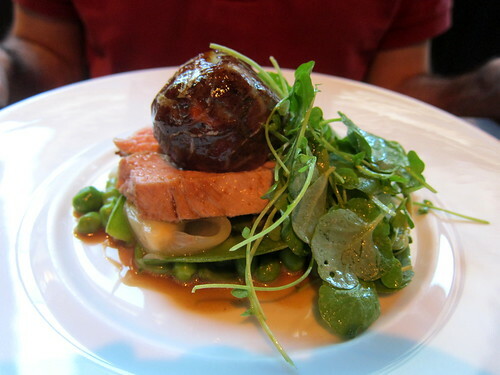 This was served with lots of spring vegetables – peas, mangetout, peashoots, onions. 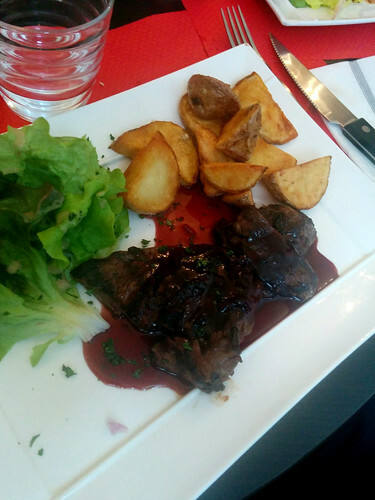 Onglet de bœuf rôti aux cinq baies, carottes et navets nouveaux, champignons de Paris et cresson sauvage. 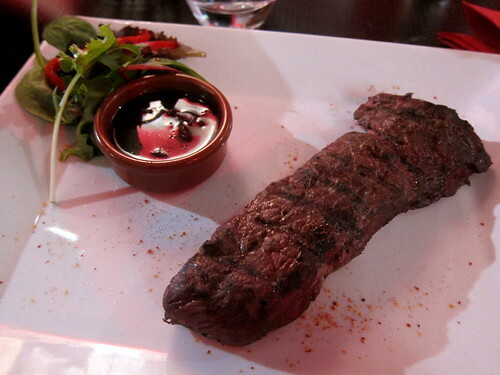 Again, perfectly cooked meat served with lots of fresh vegetables. Desserts had to be ordered right at the beginning but as the portion sizes had been well thought through, we were feeling very comfortable and were looking forward to our sweets. 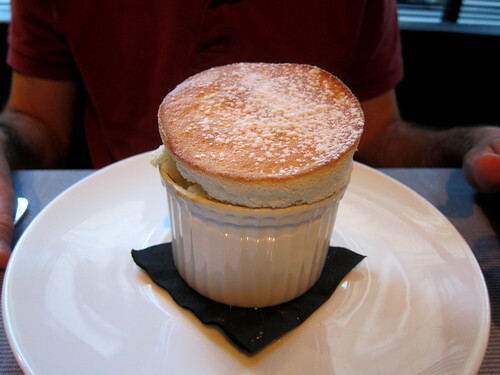 Soufflé chaud Grand-Marnier seemed to be one of the favourites with our neighbouring tables as everyone seemed to have one. 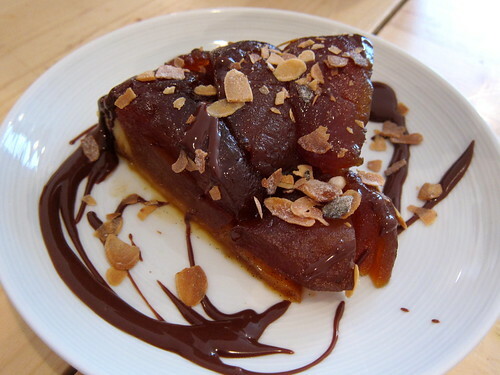 And yes, it was glorious – all hot and fluffy and with a strong hint of Grand Marnier. 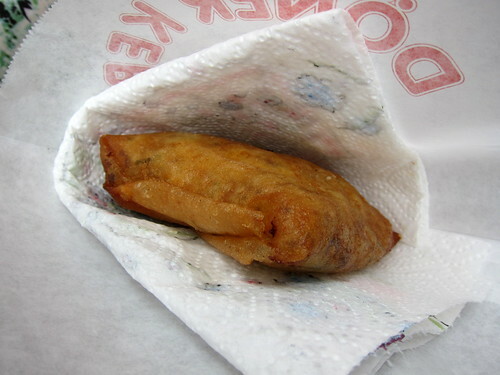 Pêche plate du Lot-et-Garonne cuite au four, émulsion de verveine et sorbet pêche. Oh gee, this was swell. 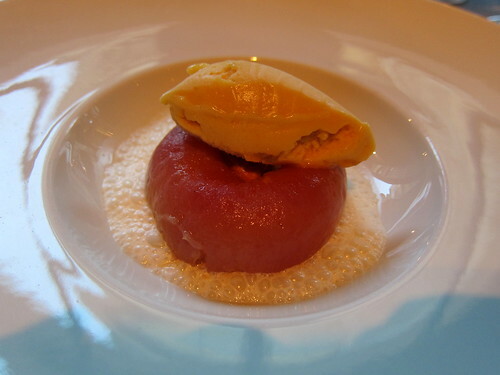 What a fabulously gently cooked flat peach, topped with the peachiest of peach sorbets and a hint of lemon verbena. 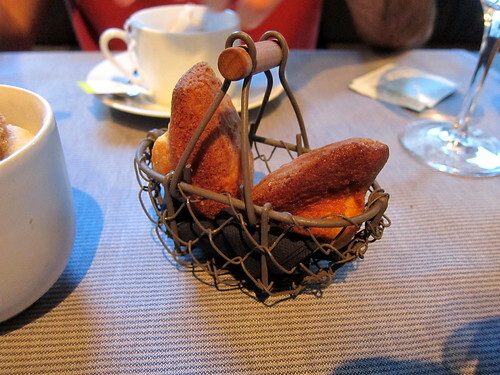 With our post-dinner teas came warm madeleines, served in the tiniest basket you ever did see. 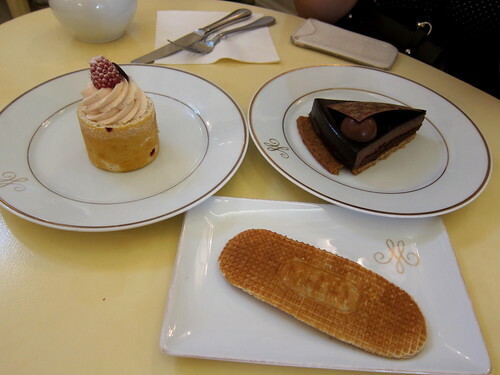 Teas were from Le Palais des Thés in Paris – and they were fantastic. Portion sizes were very well thought out and we only realised afterwards that there were no extra carbohydrates on the plates – there was only bread on the side. 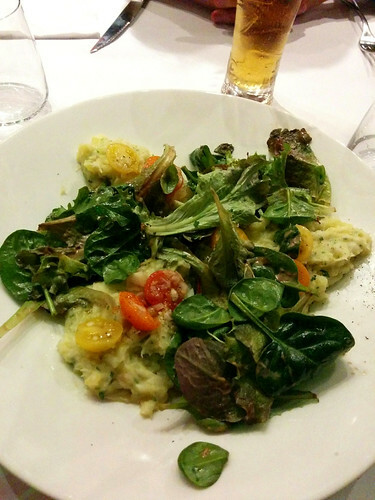 And there were plenty of vegetables too – and we loved it all. It’s definitely a lovely restaurant to spend a special occasion (or even a not very special one!). 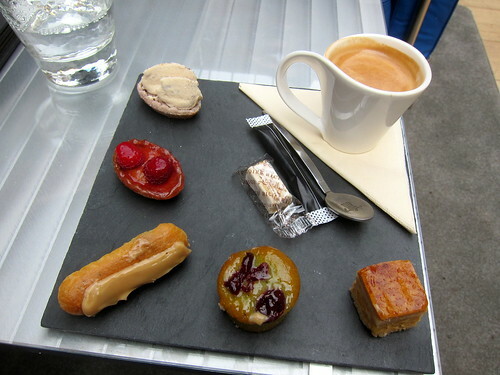 We stopped for tea that first afternoon after our time in the Musée Picasso in the 3eme and as we were nearby, I dragged Blai to Jacques Genin’s shop. 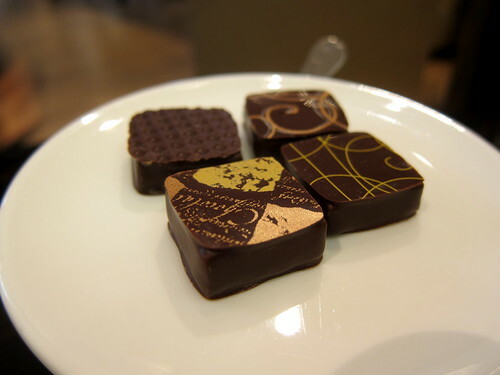 The one on rue de Turenne has a small salon de thé where you can taste his famous chocolates and caramels as well as pastries. His other shop on the other side of the river is just that – a shop. We settled into a sofa in the lovely air conditioned room. There’s a menu but the waitress also rattled off the various flavours and other pastries also available (and I believe they are made in the laboratory upstairs). 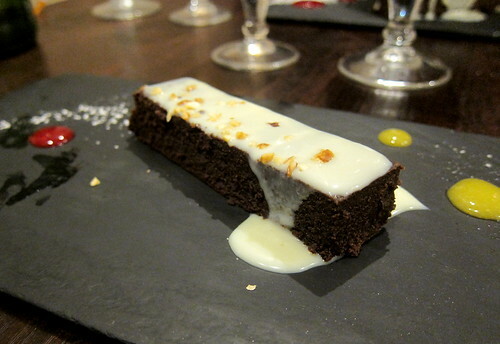 We chose a chocolate millefeille that would be put together a la minute. 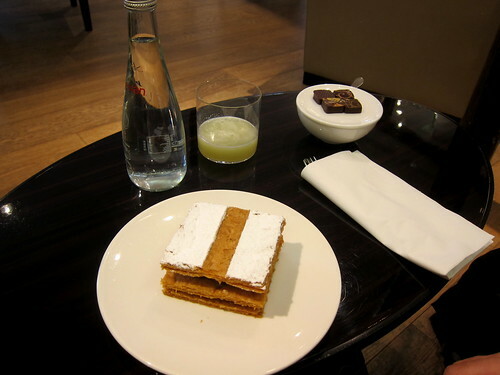 This was one excellent millefeuille. Coffee for me and a citron pressé for Blai. The chocolates they provided with the drinks were utterly amazing. Seriously, just get them. 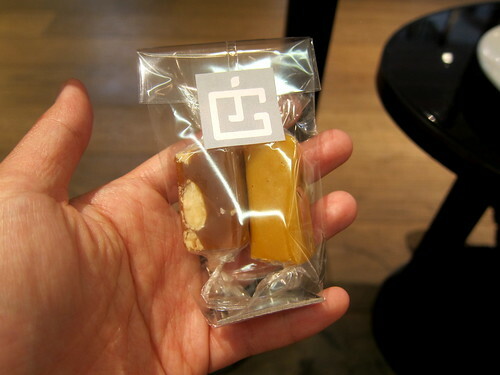 We bought a couple of his caramels to takeaway (look at the cute little bags they have for small numbers of sweets) and ate them about an hour later. By that time, they’d softened in the heat in my bag to possibly a perfect texture – they were utterly luscious. I only wish I could have brought back more but the very hot weather prevented all of that. 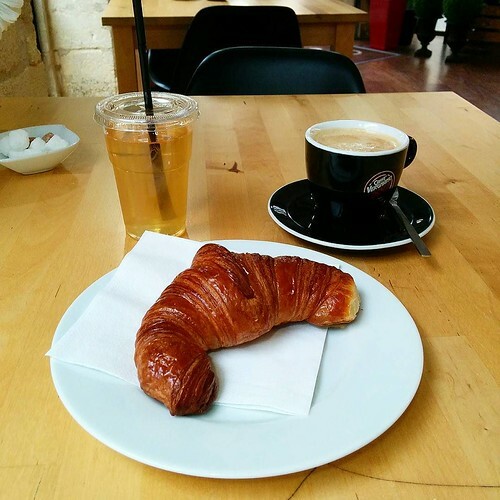 Here’s a good tip: this salon de thé is open on Sundays. 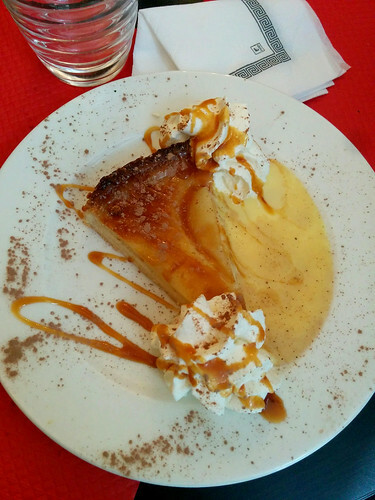 We finally made it to Breizh Cafe on this Paris trip; this restaurant specialises in the galettes and crepes from Brittany and is probably on everyone’s list of places to eat in Paris. I’d recommend getting there soon after their opening time for lunch if you’re trying to get a table without a reservation; and even if you have a reservation, don’t be surprised if you’re seated in their shop next door (it’s perfectly normal though we saw some tourists leave in a huff when presented with that option). We got there about 15 minutes after they opened and got a prime table on the sidewalk; soon after, the entire restaurant was full. 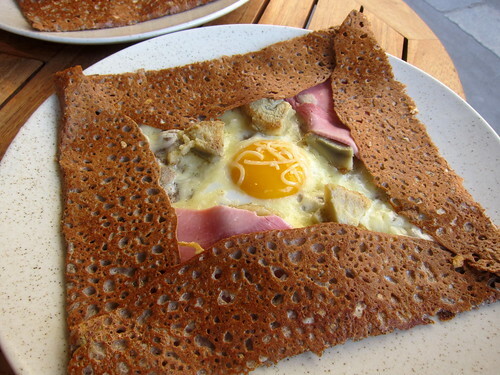 A Galette Artichaut was the classic complète – ham, cheese and egg – with the addition of artichoke hearts. Perfect. 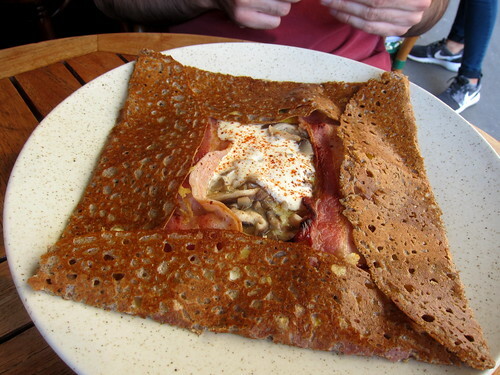 Of course, we couldn’t leave without a sweet crepe. 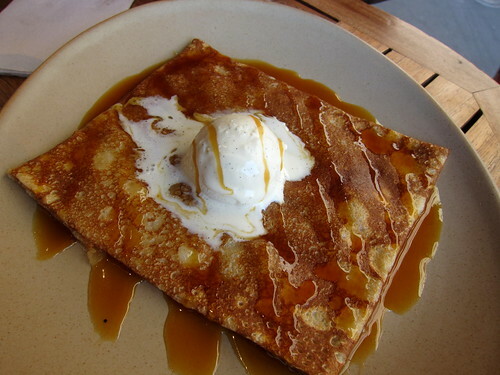 After a long deliberation, we finally decided to split a Crepe Quimperone – a crepe filled with apple puree, drizzled with the cafe’s salted caramel sauce and topped with vanilla ice cream. Yes, it was as incredible as it sounds. I see now why there’s always a crowd here! We’ll be back. We spent last weekend in Paris – it was a much needed break from work though it did feel like we traded one city full of tourists for another. That said, I love the change of culture, of language, of scenery. 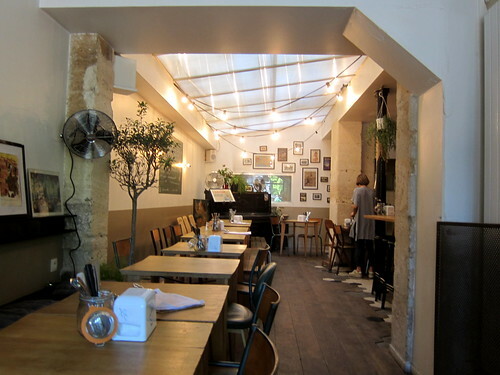 On Friday evening, we caught a Eurostar train to Paris, checked into our hotel in the 11eme and then headed straight out to find the nearby Les Niçois, a bar/restaurant that brings the French Riviera to Paris. It was crowded on that Friday night but we just managed to find the last two seats in the place. 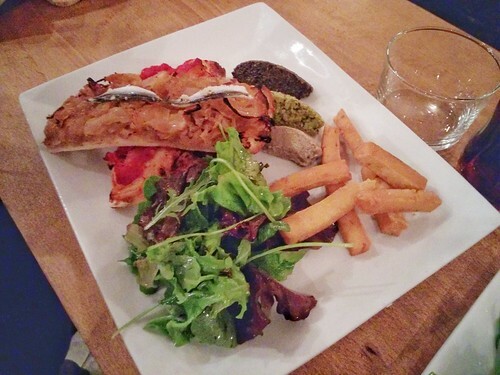 We also managed to order food just before the kitchen closed and we dined on an Assiette Nissard, featuring a variety of Niçoise specialties: pissaladiere, pizza nissarde, panisses, tapenades noire et verte, anchoiade. With a basket of bread, this was a perfectly sized sampler of fantastic treats from the south for one person. But we were two and we needed a couple other light dishes. 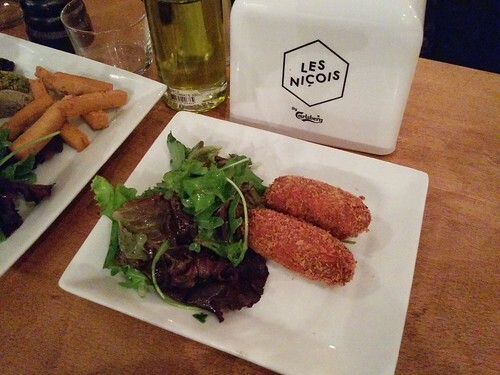 Croquettes were filled with a vegetable mixture similar to ratatouille, the flavour of which was very reminiscent of the south of France. 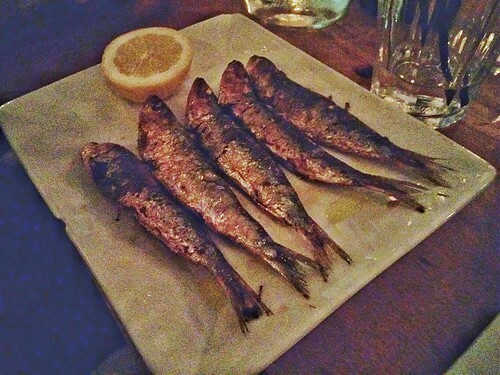 I couldn’t leave without an order of grilled sardines. These little oily fish were perfect. Just perfect. As it was close by to our hotel, we even dropped by for a drink on our last day, prior to picking up our luggage and heading to the train station. It was quiet on a Sunday afternoon and they were preparing for the barbecue they hold every Sunday evening. I’m leaving what’s possibly the best for last! 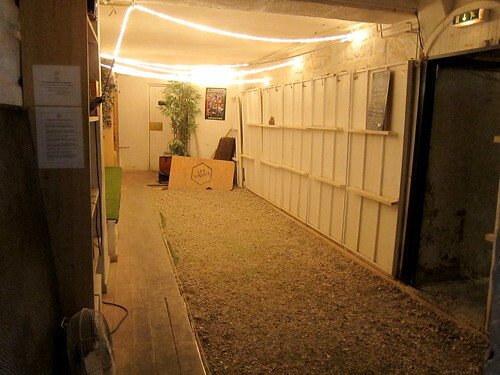 They have a games room in the basement, complete with a petanque court! It’s a seriously fun place! Like the title says, this was a much needed weekend away. It was a girls’ trip and it was going to be all about food and shopping, a proper escape from the working weekends we’d all been having recently. We met at St Pancras after work on the Friday night and caught the last Eurostar train to Lille, arriving a little after 10pm. If you’re familiar with Lille, you’ll know that there’s not much open in the centre past 10 or 11pm but we did just manage to dump our bags at our hotel and then go straight to Flam’s for a flammekueche dinner. We sat outside and dined on two of the flams and a warm salad. 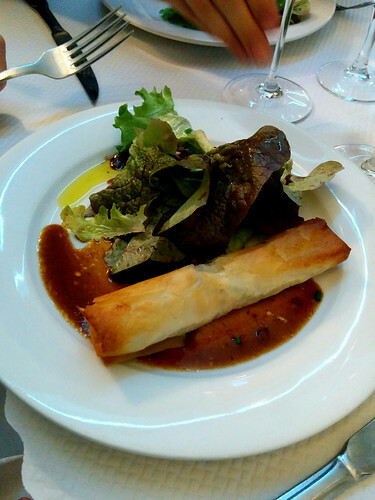 I loved the thinness of the tartes and how light it all felt (yeah, sure, there was cheese on top and plenty of lardons on everything but, look, salad!). 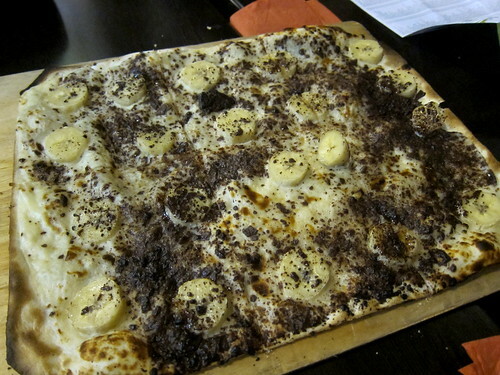 And we couldn’t help it and shared a chocolate banana flam for dessert as well. With drinks, it came to only €30 total for all three of us. An excellent late night eat. 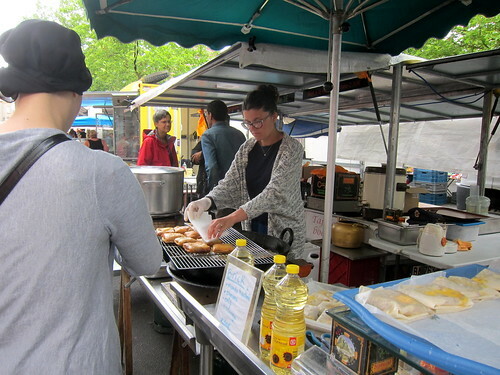 On Saturday mornings, Lille has a small local food market around the Theatre Sébastopol and the stalls all looked excellent. 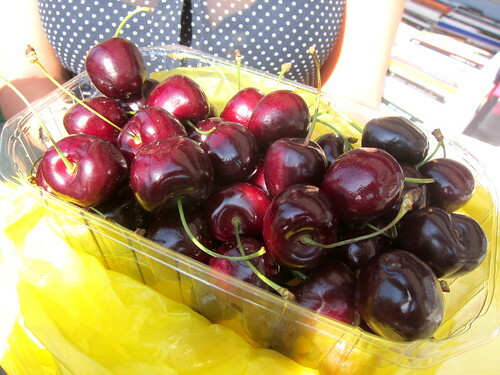 We only bought some cherries and they were very good indeed. 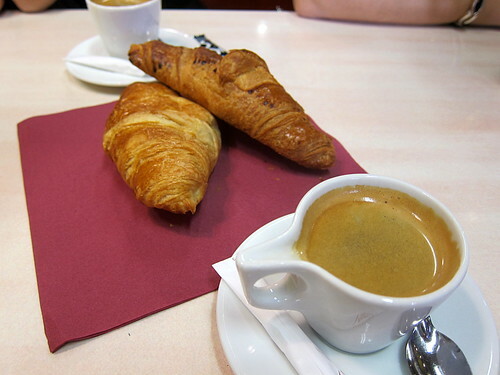 We didn’t find the breakfast we were looking for though, finding patisserie and not viennoiserie. 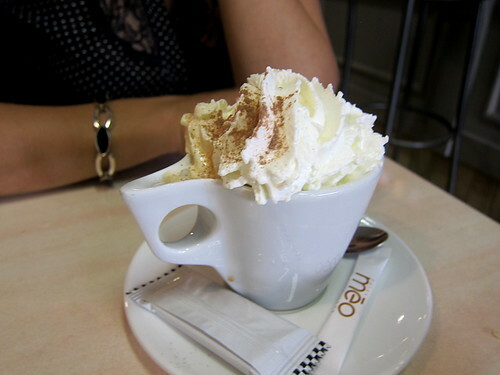 … and giggled at the cappuccino that came with whipped cream! Definitely more luxurious than your bog-standard one! Then the shopping began in earnest… and I’ll spare you the details. Well, other than to say that the sales at this time of the year were fantastic and prices were already at their third markdown. Lunch! 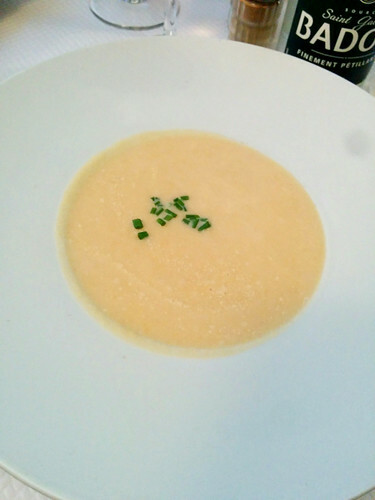 I couldn’t get a dinner booking at Bloempot, run by Florent Ladeyn of French Top Chef fame, for any time in July and instead we tried to get a walk in table for the midday meal… and we succeeded! By going a little early (12:30) we had our pick of tables in the blink-and-you’ll-miss-it restaurant down the end if a narrow alley; by 14:00 the whole restaurant was packed. 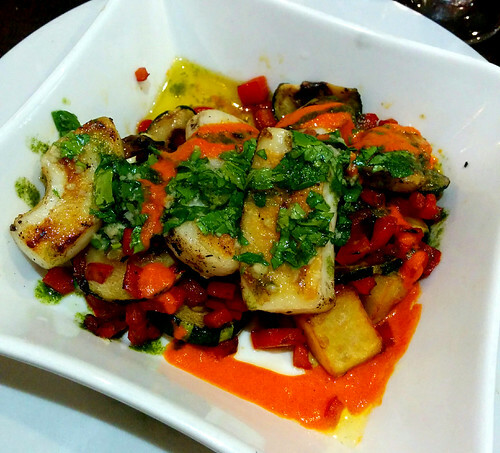 On weekends, they serve the same menus as weekday evenings. There’s a choice of three menus which differ on the number of courses you get and we went with the cheapest at €34, getting us a starter, main, cheese and dessert. Drink pairings are also available. 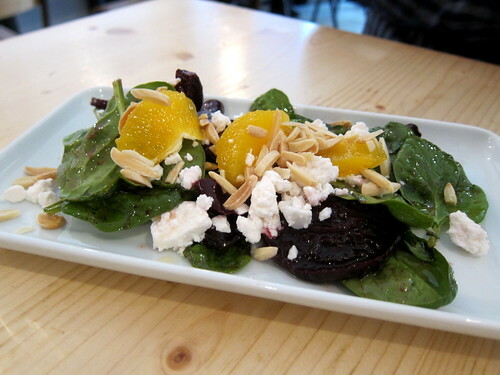 It’s a surprise menu based on what’s good at the market at that time of the year, though they do take allergies and dietary restrictions into consideration. The little extras were more generous than I was expecting. 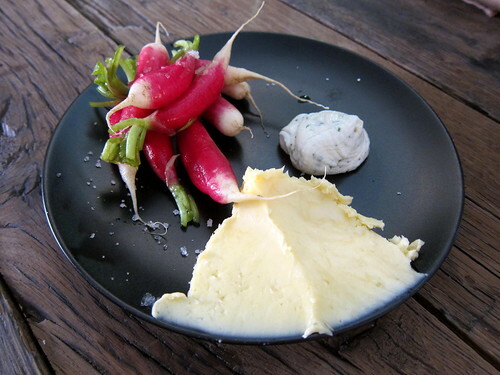 Prior to our starter, we received a mound of fresh radishes with plenty of salt, butter and a soft fresh cheese. Very good bread too, in a paper bag. Our starter was a beautiful roulade of thinly sliced kohlrabi with a quenelle of a fresh drained cheese topped with tarragon. Our main course was fish. 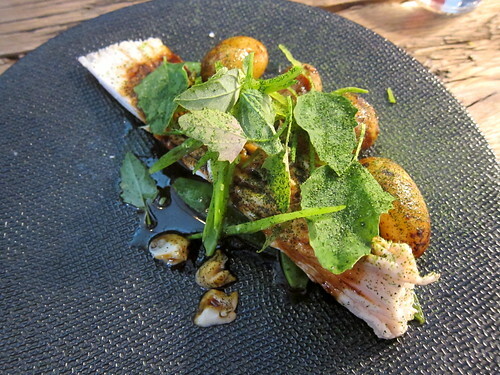 A perfect piece of skate was served with sliced razor clams, mangetout and the loveliest little potatoes. Then came what we originally thought was our cheese course. 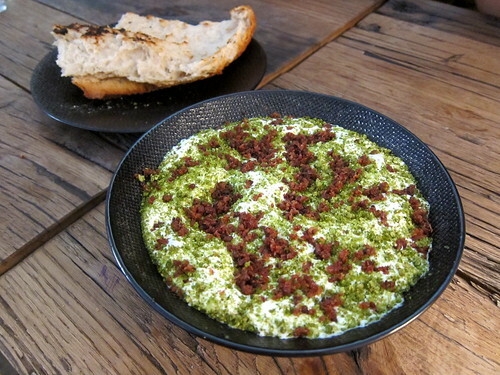 This was a massive bowl of maroilles foam topped with lardons and parsley crumbs, served with a big hunk of toasted bread crust for dipping. 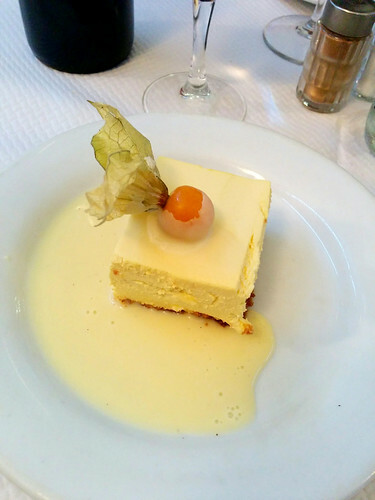 (Maroilles is the famous odoriferous cheese of the region) It was insanely good and we requested spoons to hasten its transfer into our mouths. Our waiter then came around with three small glasses half filled with a yellow-green liquid. 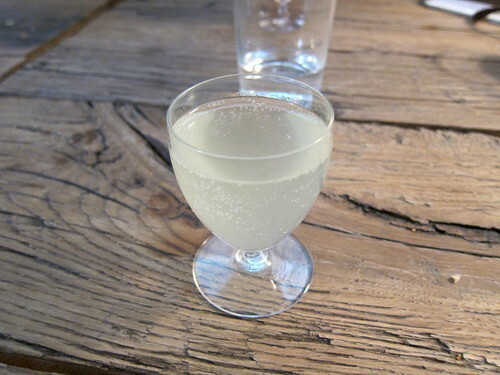 He explained that we were being served a limonade made using their homemade sorrel syrup and topped up the glass with fizzy water. It was a lovely and necessary touch to clear our palates after that cheese onslaught. 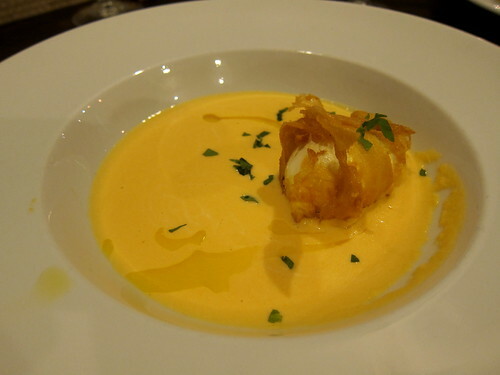 Our actual cheese course then arrived – yes, the Maroilles foam was an extra. 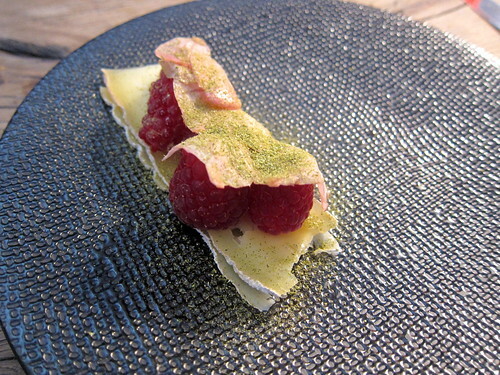 This was thin slices of tomme de sec bois topped with fresh raspberries, rose petals and a drizzle of syrup. Dessert was a dream. 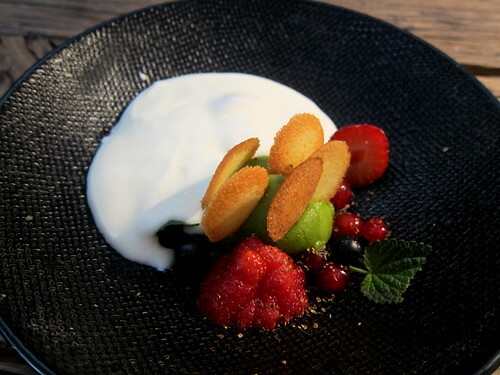 Fresh perfect berries, sorrel sorbet, langues de chat and a milk custard ladled on the side – I could have had another few bowls! Then it was back to shopping. 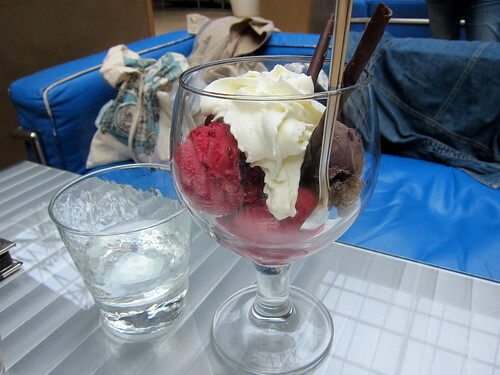 When the shops finally did us in, we headed straight to Meert for refreshments. The cakes were all excellent as usual (and that waffle!) 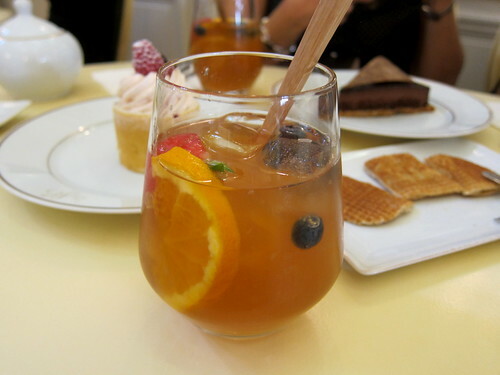 and the iced tea was exactly what I needed. We swung by the hypermarket next to the train station and picked up goodies for home before finally taking a break at the hotel before dinner. Can you tell that we were trying to cram all the shopping in on Saturday? Like most other places in France, 99% of Lille shuts down on Sundays. 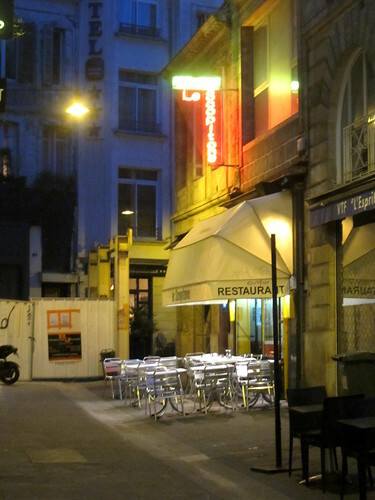 Our night was going to be spent on Rue de Gand, a street lined with restaurants and wine bars. 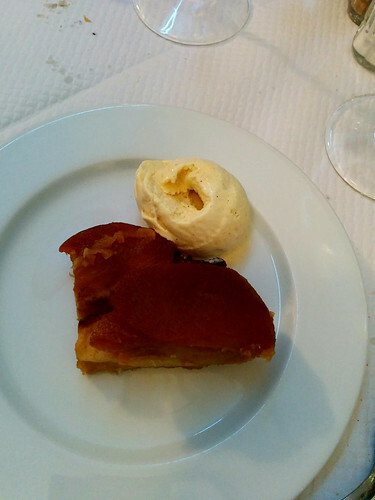 I had made a booking at Chez la Vieille, a highly regarded Lillois estaminet (and one in which we couldn’t get a table the last time I was in Lille). 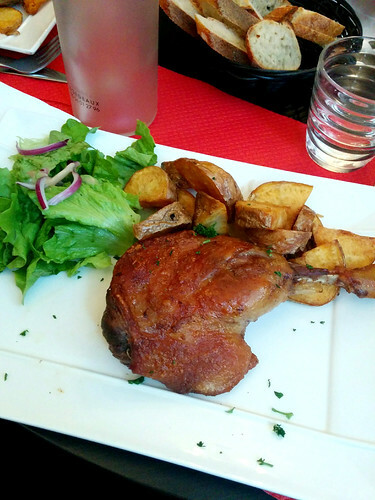 They served large portions of hearty northern French food and we struggled to finish it all. 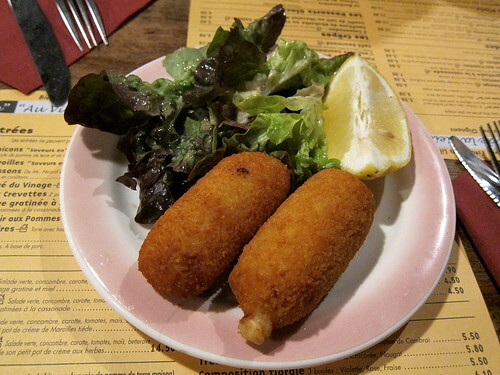 Croquettes aux crevettes were excellent and full of little brown shrimps. 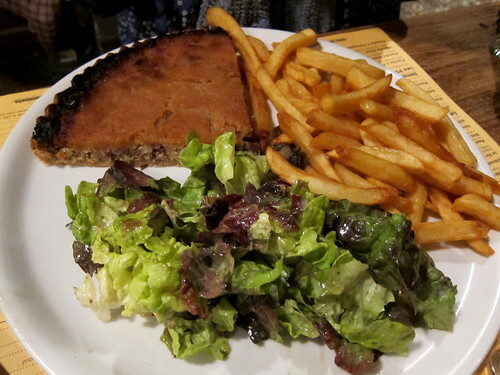 My friend’s Coeur des Flandres was a fantastic homemade tart filled with minced pork, onion and apple. My Gratin de la Vieille was insane. 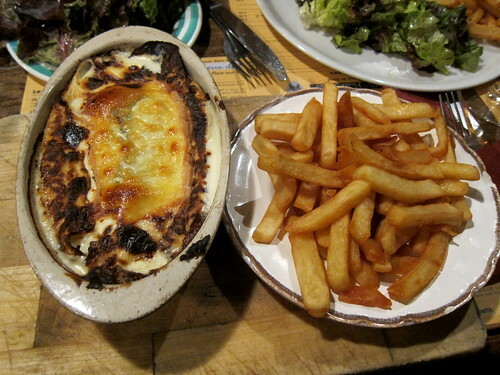 An entire cooked endive (and a fat one at that) had been wrapped in ham and then drowned in plenty of bechamel and topped with maroilles cheese before being grilled on top. 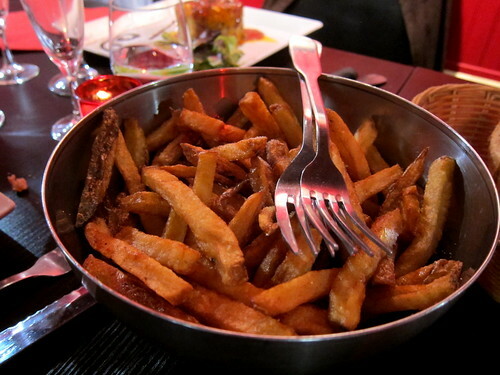 With frites! And then we crashed back at the hotel…and I think all the day’s cheese affected the others as they awoke around me recounting strange dreams the next morning. Haha! 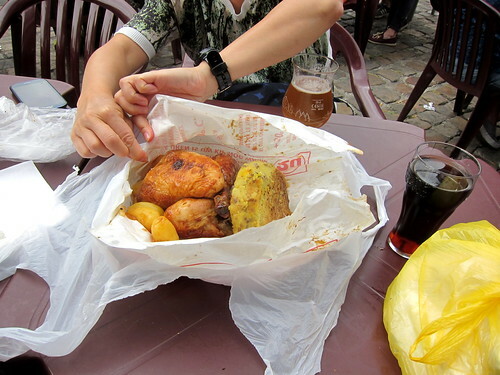 We checked out, dumped our now overflowing bags, and headed straight to the Marché de Wazemmes. The walk along the way was through a deserted city but as we got nearer to the market, it became exceedingly clear that the entire city was there. The first thing I did was find the lady who was selling Tunisian bricks – this was the brick that got away the last time I was in Lille! It hit the spot. This one was filled with minced lamb and onions and the essential egg. After walking once around the market (and perhaps I’ll mention here that not everything was peachy – we had coffee at a specialist place where they treated us badly), we noticed there was a bar (L’Oxford) at one corner with plenty of outdoor seating and everyone sitting there had ordered drinks at the bar and were tucking into food purchased at the market. Yeah, we wanted in on that! 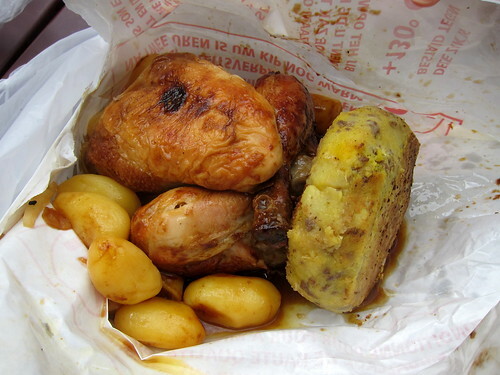 We surveyed all the rotisserie chicken vans (there were a few) before choosing our favourite and for the grand sum of €9, we received one roast chicken, plenty of potatoes that had been cooked in the drippings, and a giant spiced potato and lamb patty. That poor chicken never stood a chance. And then it was time to catch the Eurostar back to London. Back to reality. I highly recommend Lille for a short break. 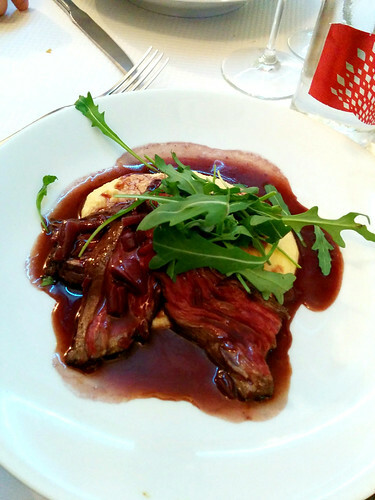 It’s easy to get there and prices at restaurants are lower than similar restaurants in Paris. And if you’re there during the sales… well, I take no responsibility for that. All my photos from Lille can be found in this Flickr album.